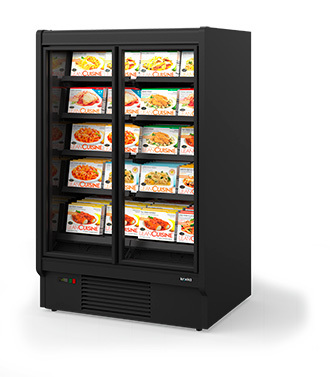 Koxka ICE Plug in is a range of top-quality plug-in refrigerated multi-deck cabinets. They offer flexible installation and efficiency for store surfaces, improving the shopping experience. Designed in compliance with the Ecodesign directive to reduce the environmental impact. The mixed exhibitor MX combines in one product the advantages of a closet and an island. Your customers rely on you to give them fresh quality products when they need them. The counters in the ICE PLUG IN range are the most reliable ever, giving you the perfect tool to do just that. Their high capacity and large display area enhance the customer experience, resulting in impulse buys and repeated business. Plug-in frozen chest Joinable to form lines or islands back to back.